For over a century, Rosedale Presbyterian Church has been actively engaged in mission locally, nationally and internationally. Our mission-minded history continues to this day with our partnerships in St. James Town, participation in Boarding Homes Ministry, and education efforts in Malawi, amongst others. 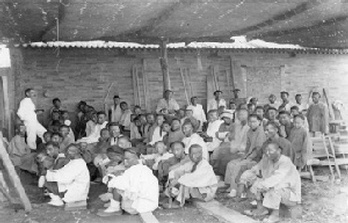 In the early 20th century, as RPC was preparing to build on her present site, she received an urgent appeal for financial assistance to build a church in China. Diverting funds from her own construction budget, Rosedale sent $3000 for the construction of the first Rosedale Church - in Hunan Province, China, in 1908. Following the First World War, Rosedale Memorial Hospital was built to provide medical services in northern Ontario at Matheson. What was to be a congregational young women's project to support the salary of one nurse, developed into the funding of a full medical facility. The people of Rosedale Presbyterian Church continue to engage in missional activity to this day. Members of our congregation support the ministries of Evangel Hall, Portland Place and Out of the Cold, and are becoming more involved in the St. James Town after-school Homework Club. This after-school programme is an ecumenical venture with four other local congregatons. To volunteer with the St. James Town Homework Club, or to find out more, please contact co-ordinator Suchana Pandey: (email address: suchanapandey@gmail.com). As a community of faith, we desire to build upon our long-standing commitment to express love for God, and for our neighbours to the ends of the earth. This page is a resource for those who desire to participate in established mission and outreach opportunities, and for those who are seeking to initiate new forms of ministry in our community.